One of the best ways to #BringBackWildhood is to grab your hiking boots, round up the family and get outside. Explore the woods. Gaze along a scenic shoreline. Breathe in fresh mountain air. Admire the natural beauty that surrounds us. For a little inspiration, check out these 10 family-friendly hikes and nature walks in Canada, recommended by fellow adventurers coast-to-coast. Happy trails! You know that feeling when you go somewhere that reminds you of that movie you saw’ Cathedral Grove on Vancouver Island features a forest of trails and pathways lined with ancient (and very tall) douglas fir trees ‘ some more than 800 years old. The lush greenery oozes vivid colours and vibrant shades of lime green and olive ‘ just like the forest in that fairy-tale movie with the giant green ogre and princess (minus the swamp). The kiddos will love it. With stunning bird’s eye views of the Cabot Trail and whale watching along the Gulf of St. Lawrence, the seven-kilometre Skyline Trail in Cape Breton Highlands National Park is a must-see while in the Maritimes. The trailhead is located near Chéticamp, a quaint Acadian fishing village. Locals rave about the series of scenic lookout points (accessible from a long set of stairs) where you can enjoy panoramic vistas of the Nova Scotia coastline. Don’t forget to bring your binoculars! ps ‘ Dogs are not permitted on Skyline Trail, as they may disturb wildlife in the area. Two gorgeous waterfalls in a 90-minute return trip’ We thought that might pique your interest. Johnston’s Canyon features a series of canyon-clinging catwalks and staircases (with railings) as well as a wooded trail en route to the Lower Falls and Upper Falls. Take in the gorgeous landscapes and listen to the splish-splash of the waterfalls from the viewing platforms. Johnston’s Canyon is one of the busiest hiking trails in the Canadian Rockies ‘ try to visit in the early morning to avoid the crowds and tour buses. If you’re lucky, the ice cream stand at the trailhead may be open and you can celebrate with an ice cream cone, après hike! ps – Always stay on the trail and keep young children under control and supervision at all times; the viewing decks, catwalks and staircases may be slippery when wet. Are you more of a beach bum than a forest dweller’ Check out the Singing Sands Beach on Lake Huron. Take a leisurely stroll, dip your toes in the water, find the perfect spot for a sunset picnic and enjoy a day at the beach with the family. Singing Sands also features a number of easy ‘beach-focused’ trails ‘ see the map in the parking lot for details. ps – Pets must be on-leash at all times. Salt River Meadows is a short 1.3km hike in Canada’s largest national park, Wood Buffalo National Park ‘ also a World Heritage Site. Enjoy an easy pace on this relaxing stroll through a wildflower meadow along the stream. Grassi Lakes is a popular hiking destination in the Canadian Rockies. The trail offers two routes ‘ an easy route with a gentle incline along a gravel access road, or a difficult scenic route through a wooded trail (past the Grassi Lakes Waterfall) and a steep stair-climb to the lake. Both routes feature majestic, bird’s eye views of Canmore and two beautiful turquoise-blue lakes. There are plenty of easy trails to explore in the Mount Fernie area ‘ and they’re relatively close to town with nearby camping/RV sites available seasonally. The Sherwoody/Gorby Trail is a great family-friendly hike in the Kootenay Range, at the base of Mount Fernie and trailhead to Island Lake Lodge, with local flora and fauna to spot along the way. ps ‘ These are multi-use, shared trails with mountain bikers, so be aware of your surroundings while on the trail. For the Anne of Green Gables fans in your family, this hiking trail is a must-see when visiting the Gentle Island. The Haunted Wood trail is a forest-like area that inspired the namesake scene in the world-famous story. Note: Entry fees apply to Green Gables Heritage Place. Bird-watching, a walk in the woods and a lighthouse to boot’ Lighthouse Trail is a family-friendly hike (approximately 1.5-hour return trip) along a peninsula, featuring panoramic views of Gull Harbour and Lake Winnipeg. The kiddos will be fascinated by the cool factor of the 1920s-era lighthouse (which is still in use!). Looking for a quick hike during a pit stop in Fundy National Park’ With stunning views of the Point Wolfe River, Shiphaven Trail is an easy distance at 1.0km return trip (approximately 30 minutes). This trail features the best of both worlds ‘ forest and coastal views. Enjoy a leisurely pace along the boardwalks and stairs, and get a mini-history lesson from the interpretive panels along the way. Looking for more summer vacation ideas for your family’ Get started with our handy RV trip planner. 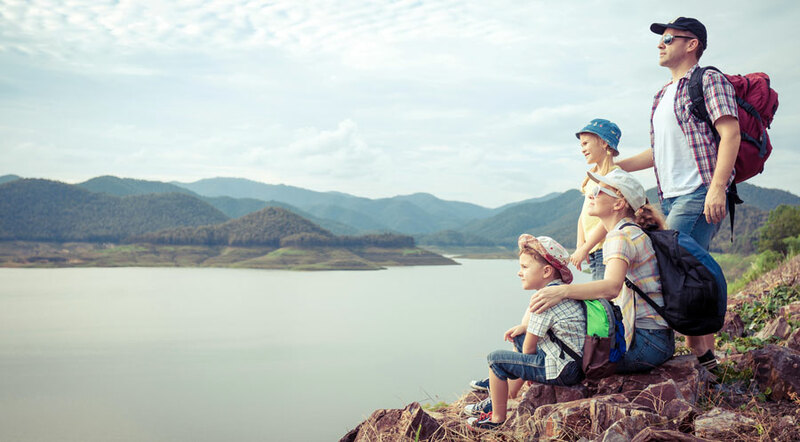 Any of your favourite family-friendly hikes missing from this list’ Feel free to share your ideas with our #RVersKnow community! Connect with us on Facebook, Twitter or Instagram.